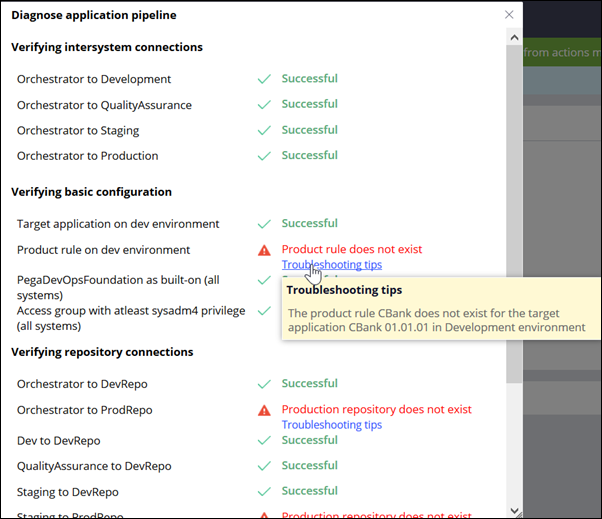 In Deployment Manager 3.3.x and later, you can now diagnose your pipeline to verify that it is configured properly and to view and troubleshoot any issues that are discovered. For example, you can verify that the target application and product rule are on the development environment, connectivity between systems and repositories is working, and premerge settings are correctly configured. By diagnosing your pipeline, you can quickly fix issues that could prevent your application from being deployed. In addition, you view troubleshooting tips for errors, which provide helpful information so that you can quickly resolve issues in your pipeline. After you click a pipeline, you can diagnose your pipeline by clicking Actions > Diagnose pipeline.